A national disabled people’s organisation is to provide disability equality training workshops to staff from the controversial US-owned company that won the government contract to assess people’s “fitness for work”. Disability Rights UK (DR UK) will provide training to about 1 600 members of staff employed by the Centre for Health and Disability Assessments (CHDA), which is owned by the US outsourcing giant Maximus. Every member of CHDA staff – including healthcare professionals, managers and reception staff – will go through the training, which will be delivered through about 100 two-hour workshops. Maximus took over the work capability assessment (WCA) contract – which involves testing disabled people’s eligibility for employment and support allowance (ESA) – in March from another discredited outsourcing company, Atos. Just five months later, Disability News Service (DNS) reported how Maximus was facing allegations that CHDA discriminates against disabled staff – allegations the company denied – by falling to provide them with the adjustments they need to do their jobs. The decision of DR UK to work with Maximus on a training contract that could be worth up to £100,000 has reignited the argument over whether disabled people’s organisations should engage with companies profiting from the government’s divisive welfare reform agenda. There are long-standing concerns over the WCA, with DNS revealing last month that a coroner had for the first time decided that a disabled man had killed himself as a direct result of being found fit for work. 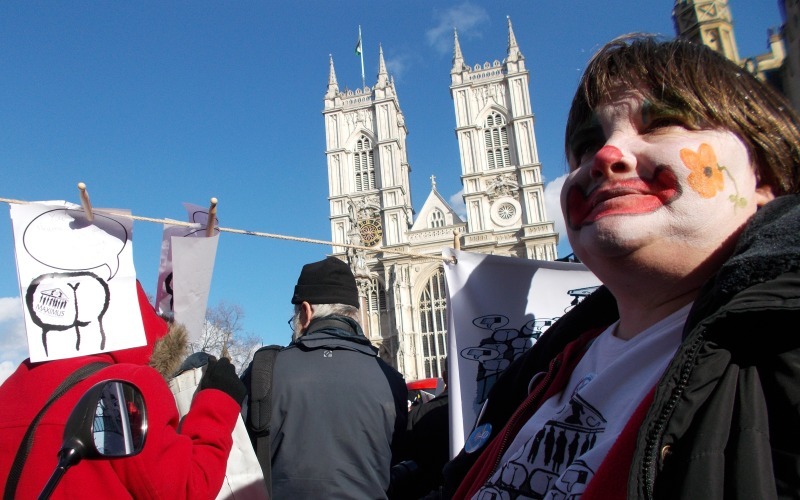 Disabled People Against Cuts said DR UK had “once again sold their legitimacy to the highest bidder”. A DPAC spokesperson said: “This was the organisation that had Craegmoor – a group running institutions and segregated education – sponsor their last conference on ‘independent living’! “DR UK can no longer claim to speak for disabled people. As more and more people reject DR UK, more and more people join DPAC. Rick Burgess, co-founder of New Approach, which was set up to campaign for the WCA to be scrapped and replaced, said there was often a “fine line between harm reduction and enabling abuse”, but he added: “Given what we know of the Department for Work and Pensions and Maximus, I have to say that DR UK have betrayed us again and sided with abusive practice. “They will not in any way be able to alter policy or the law, so the WCA will remain a fake medical inflicted by people with disability denial targets. Pat Onions, founder of Pat’s Petition, said she was “totally disgusted” that DR UK had “bid for, been accepted, and now are contracted to work with” Maximus. She said: “DR UK say they agree with the rest of us that the WCA is so flawed it needs scrapping. “How on earth can so-called ‘training’ Maximus staff to understand the needs of disabled people ever work? Onions said Maximus had a “well-documented track record of appalling behaviour towards disabled people”. And she suggested that because contracts linked to the government appeared to make up a significant part of DR UK’s income, the question had to be asked whether it was still a genuine user-led organisation. Gail Ward, co-founder of the user-led Cross Border Alliance, set up by four disabled activists to promote co-operation between Scotland and the north of England, said: “While we knew DR UK were offering their services to train assessors, the fact they have been contracted to do so smacks of a government wanting to silence the voices of disabled people. But Philip Connolly, policy and development manager for Disability Rights UK, defended the decision to work with Maximus. He said: “DR UK won the contact to provide equality training to healthcare professionals carrying out the work capability assessment earlier this year. “We decided, after much deliberation, to apply for the contract because we knew we could provide high quality trainers with personal experience of disability, and therefore could have an impact on healthcare professionals delivering the work capability assessment. “We have always said the WCA is flawed and that hasn’t changed. And she said that arguing that DR UK should not work with Maximus, because of its track record in the US – where it has faced a number of scandals relating to discrimination, incompetence and alleged fraud while delivering public contracts – would imply that the company “should work with no disabled people’s organisations at all”. A Maximus spokesman said: “We have a partnership in place with Disability Rights UK, who are providing disability equality and awareness training to all our staff, so they have a better understanding and empathy with our customers. “This was proposed to DWP as part of our planning when we assumed responsibility for the contract. Meanwhile, disabled campaigner and researcher Stef Benstead has been commissioned by the Christian political think-tank Ekklesia to come up with plans for a replacement for the WCA. As part of the research, Ekklesia has launched a survey designed for people with long-term health conditions to explain “what affects their ability to find and keep work, what support they need and what a proper assessment process should look like”. Benstead will analyse the survey results and write a report presenting an alternative to ESA and the WCA, based on the responses to the survey. She was lead researcher on the Beyond the Barriers report – which examined the failings of the ESA system and the Work Programme for disabled people, on behalf of the Spartacus campaign network. And Tom Brake has become the first Liberal Democrat MP to sign up to the WOWcampaign, which aims to force the government into assessing the overall impact of its cuts and reforms on disabled people. By 7pm this evening (Thursday), the WOWpetition had attracted more than 20,100 signatures. If it reaches 100,000 signatures by 13 February, the petition should be debated in the House of Commons. Brake has also written to work and pensions secretary Iain Duncan Smith, urging him to carry out such an assessment.